Having good contacts is important – not only in your daily life, but also in electronics. In contrast to social contacts, the reliability of electrical contacts can be checked quickly and easily. Various types of continuity testers are commercially available for this purpose. Most multimeters also have a continuity test function for electrical connections. A simple beep helps you tell good contacts from bad ones. However, in some cases the tester doesn’t produce a beep because it won’t accept contact resistances that are somewhat higher than usual. Also, poorly conducting (and thus bad) connections are sometimes indicated to be good. Here e-trix comes to your aid with a design for a DIY continuity tester that helps you separate the wheat from the chaff. Many multimeters have a built-in continuity test function. However, in many cases the resistance necessary to activate the beeper when you are looking for bad connections is just a bit too high. It can also happen that the beeper sounds even though the resistance of the connection is unacceptably high. This circuit lets you adjust the threshold between bad and good contacts to suit your needs. The circuit is built around an operational amplifier (IC1) wired as a comparator. The opamp compares the voltage on its inverting input (pin 2) with the voltage on its non-inverting input (pin 3). The voltage on pin 3 can be set using potentiometer P1, so you can set the threshold between good and bad connections. When test probes TP1 and TP2 are placed on either side of a connection or contact to be tested, a voltage is generated across the probes by the current growing though resistors R1 and R3, and it appears on pin 2 of the opamp. This voltage depends on the resistance between the probe tips. If the voltage on pin 2 is lower than the reference voltage on pin 3, the difference is amplified so strongly by the opamp that its output (pin 6) is practically the same as the supply voltage. 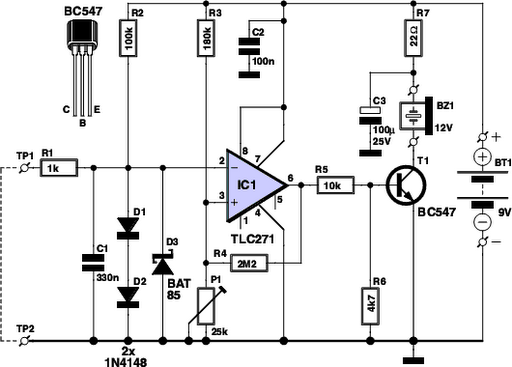 This causes transistor T1 to conduct, which in turn causes DC buzzer BZ1 to sound. This means that the resistance of the connection being tested is less than the threshold value set by P1, and thus that the connection is OK.
By contrast, a bad connection will cause the relationship between the voltages on the inputs of the opamp to be the opposite, with the result that its output will be at ground level. The transistor will not conduct, and the buzzer will remain still. To ensure that the opamp ‘toggles’ properly (which means that its output goes to ground level or the supply voltage level) when the difference voltage is sufficiently large and does not oscillate during the transition interval due to small fluctuations in the difference voltage produced by interference, its output is coupled back to its non-inverting input (pin 3) by resistor R4. This causes any change on the output to be passed back to this input in amplified form, with the result that the detected difference voltage is amplified (and thus boosted). Diodes D1, D2 and D3 protect the circuit against excessive positive and negative input voltages that may come from the connections or contacts being tested. They also ensure that the continuity tester does not inject excessively high voltages into the item under test. Capacitor C1 suppresses high-frequency interference. The circuit draws only a small supply current, so it can easily be powered by a 9-V battery.